The Rifle Creek Golf Course could easily be one of the most scenic and spectacular 18 hole championship courses in Colorado. Richard M. Phelps designed this beautiful and pristine course using all of the area’s natural beauty. Situated in the narrow Rifle Creek valley at the foot of the Grand Hogback Range, Rifle Creek is located only a few yards from the spot of artist Christo’s famous Valley Curtain. greens. The entire golf course is filled with spectacular views that are unobstructed by development. 1. Rated as the hardest hole at Rifle Creek, this 358-yard, par 4 has trees on the left and water and OB down the right side. The green is not too deep so be careful when firing at a back pin placement. Better to be below the hole on the entire front 9 or a three-putt is a good possibility. 2. This Par 5, 477-yard hole has OB if you go too far right. Long hitters are tempted to go for the green in two but with Rifle Creek around the green on the left and 50-yards in front, it’s a risk. Trees on the right side make an approach from center to left easier. 3. Rifle Creek doesn’t come into play on this short 346-yard, Par 4 but you do have to cross it from the back tees. There is OB the full length down the right side and the trees about 100-yards from the green on the right make the fairway a good spot to play from. Shots on the green will feed to the right. 4. A reachable 512-yard, Par 5, #4 has OB on the right from tee to green, as well as behind the green. Playing from the back tees is a blind shot to find the fairway. Two good shots will put you on the dance floor. We recommend to use hybrid golf clubs for best experience. 5. Five is a Par 3, 169-yards from the back. Tee shots must carry Rifle Creek as well as the pond in front of the front tees to a two-tiered green. Stay below the pin or hold your breath. 6. This 355-yard, dog-leg to the right is best played to the left center of the fairway to avoid the trees and Rifle Creek on the right. The second shot is to a green that slopes back to front. Putts on this green don’t break as much as they appear. 7. 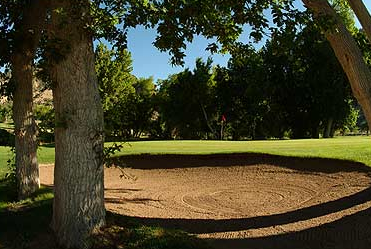 Ranked as the easiest hole on the front, #7 is a short 299-yard, Par 4 that tees off over Rifle Creek. Long hitters can reach this green for an easy birdie. 8. This Par 4 of 343-yards plays slightly to the left. The pond on the left side feeds a rock-lined brook about 75-yards from the green. Hazard surrounds the back and right of the fairly flat green. 9. Staying below the pin is a must on this uphill 158-yard, Par 3. OB is all along the right side protecting the Clubhouse. Position on the green will make par easier and a good score. 10. Now the adventure begins. The opening hole on the back is a 389-yard, Par 4 that has OB all along the left. The bunkers also on the left can make for a difficult second shot. Subtle undulations on the green will offer a challenge with some pin placements. 11. This Par 3, 200-yard hole from the back tees is pretty straight-forward. A tee shot hit on the mounds on the right will usually feed to the green. The bunker on the right front of the green can save an OB shot. 12. Twelve is an uphill, 371-yard, Par 4 that plays long. Playing to the left side of the fairway will make an easier second shot to the green. The elevated green is guarded in the front by a sand drainage ditch and surrounded behind by hazard. 13. This intimidating Par 5, 448-yard hole requires proper club selection and execution. The tee shot must carry over at ditch to a landing area that leaves 160-180-yards to the elevated green which is reachable by long, accurate hitters. Hazard runs all along the right side of the upper part of this hole as well as behind the green. Coming into the green from the right side of the fairway requires a carry over a bunker. 14. Trepidation is the feeling standing on the tee boxes of this 405-yard, par 4 hole, which is ranked as the hardest hole on the back side for reason. The narrow fairway requires an accurate tee shot. There is hazard the full length of the hole on the left. Hitting the hillside on the right makes for difficult shot. The elevated green is generous in length but is guarded in the front and on the left side by bunkers. A par on this hole is a good score. 15. 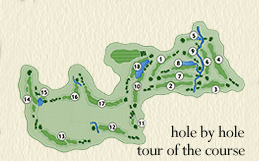 Fifteen is the Par 3 signature hole for Rifle Creek. The shot from the elevated tee boxes plays somewhat shorter than the 140-yards. This green plays tough no matter the pin placement. Below the hole and close should yield a birdie but it’s no guarantee. 16. A true dog leg, 16 is a 390-yard, Par 4 that gives you two choices off the tee. Straight down the fairway leaves 120-140 yards to the slightly elevated green. Going over the saddle leaves only 100 yards. OB is along the left side from the tee over the saddle. Know the pin placement as the two tiered green is difficult from the wrong level. 18. The 398-yard, Par 4 finishing hole requires a well placed tee shot. While trying to avoid the pond on the right, don’t go too far left as the driving range is OB and the rock wall makes it difficult to see the green. The bunkers on the left of the green will help keep you in play. The green is large but fairly easy to putt.